My experiment in wide field imaging out at the Madison Astronomical Society's dark sky site last night proved to be a struggle, but did yield a product I am happy with. Here is a large portion of the constellation Hercules. 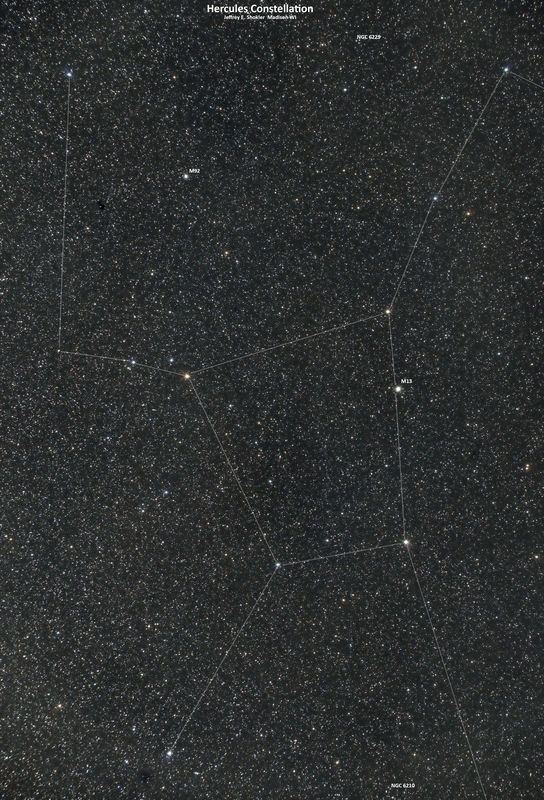 This constellation covers almost 3% of the night sky, and contains within its boundaries the famous "Great Hercules Globular Cluster" (Messier 13). I've added the modern constellation lines as well as manually annotated some of the observable Messier and NGC objects in the field of view. I'm pleased with this - my first attempt at wide-field astrophotography (I know, I kinda went about this rather backwards). I hope you enjoy it! Nice one! I was going to shoot that same area last night for the first time with a 135mm but clouds determined otherwise. My pal the Finn (lives in Middleton, maybe you know him!) has been shooting this way the last couple of nights we've been out. I really should look into the MAS. Although there's a plus to imaging solo: when I'm raving and waving my arms about over some problem with my equipment, no one but the deer and raccoons are discomfited.